Z no longer has physical therapy sessions at the therapy center. Per his development-pedia’s advise during the last consultation, we need to concentrate on occupational therapy now for his behavioral and fine motor skills development. So what we do is let Z do as much physical activities in his day to day routine as much as we can. He now climbs on chairs, jumps on the bed, walk up and down the stairs (with assistance), jumping on his gym ball (something he got from one of his therapy activities), and walking and running. We are also taking advantage of the pool for swimming and water activities, especially this summer time. You can read more about this in Mama OT’s blog. Swimming is something that you really can’t unlearn once you learn how to do it. 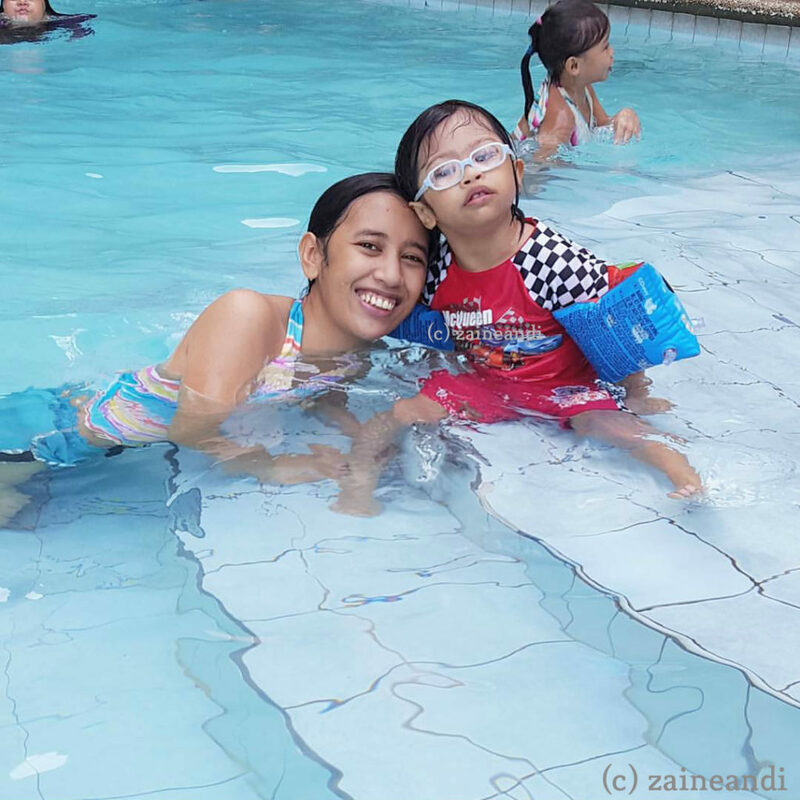 Last year, I wrote about Z’s swimming activities (you can read them here). But his swimming activities was not as consistent as it should have been because I was still dependent on what he does during his physical therapy sessions. However, even when we seldom go swimming, the little boy has been improving a lot. And I say, A LOT! Last year, he only used his swim ring for about 3 or 4 times. I also bought him arm floaters and he only used it about three times as well. Around September last year, Z ditched his arm floaters and started jumping from the pool steps, too. He was watching the other kids swimming and jumping around one afternoon and I think he decided then that he could also jump and swim. LOL! That was the start when he no longer wanted to use either the ring or the arm floaters. I think he found both to be more of a hindrance rather than support. All those swimming sessions where we asked him to “kick the water” paid off when he started swimming short distances. Both Z’s nanny and I were surprised when he was able to swim a short distance that we had him repeat it several times. This video was from October last year. This time around, he is starting to hold his breath while in the water, he’s starting to float, he’s also starting to discover that he needs to use his arms to paddle as well. We need more practice on that one though. This was taken three weeks ago. This little boy is really brave in the water. And I have to be alert all the time because he just jumps off without notice.